Traditionally arguments of the nature of Neolithic social organization have been founded, in part, on considerations of regional settlement practices and an understanding of the process by which communities become increasingly sedentary in the Epipaleolithic and Neolithic periods. Although limited by the relatively small number of excavated early Neolithic settlements in some of the larger countries in the Near East, such as Syria, Iraq, and Turkey, exploration of regional and interregional settlement practices provides researchers with important broader considerations of how community-level practices might be interlinked with those from other neighboring communities. Similarly, consideration of a broader trajectory in which increasing sedentism occurs in the transition from Epipaleolithic to Neolithic household and communities levels improves our understanding of the overall process to sedentism and how this shift might be linked to broader social and economic changes. Expanding this intellectual foundation, several researchers, in the next three chapters, address a series of interrelated regional-scale issues, including the social dimensions of the move toward increased sedentism leading into the Neolithic and how the nature of the household changed through time with increased sedentism. In an essay that focuses on the periods immediately before, and leading into the earliest stages of the Pre-Pottery Neolithic, Anna Belfer-Cohen and Ofer Bar-Yosef focus on the questions of when, how, and why Near Eastern communities became more sedentary. They note that sedentism occurred independently from the development of plant domestication with the appearance of large residential structures occupied year-round in the Early Natufian period. Archaeological remains from this period illustrate a cultural bridge linking two ways of life, one that focused on mobile hunter-gathering and one that relied primarily on sedentary agricultural cultivation, domestication of plants and animals, and herding. They argue that Natufian communities were specialized hunter-gatherer/collectors and, therefore, not based on stable social units. Specifically,sedentism and foraging are primarily opposed to each other, as limited mobility triggers progressive population growth and, by extension, resource and social stresses. The authors link these social stresses with simultaneous changes in the use of zoomor-phic art as a means of alleviating scalar stress and changing mortuary practices. 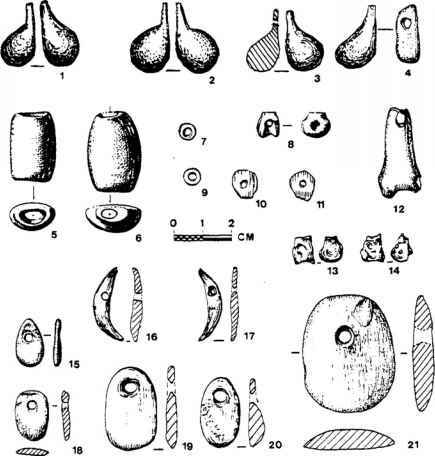 Moving to a consideration of how these practices change with the onset of the Pre-Pottery Neolithic at around 10,300 bp, Belfer-Cohen and Bar-Yosef discuss how, for the first time, we see the emergence cf large agricultural communities of several hundred people, large communal buildings, and a new emphasis on anthropomorphic art. Focusing on the excavations at Hallen Cemi, Michael Rosenberg and Richard Redding explore the nature of community organization leading into the Neolithic, in specific, and the evolution of social inequality, sedentism, and ownership among sedentary hunter-gatherers,in general. As with other Neolithic settlements, the authors note that at the site of Hallan Cemi there is clear evidence for deliberate organization of space at the structural and settlement level, in this case in the construction and maintenance of a large courtyard area with the entrances of surrounding residential structures facing away from the courtyard. Drawing on the presence of public buildings, as well as the presence of highly stylized carved stone bowls, pestles, and batons, the authors argue that this relatively small community provides insights into the existence of a social system within which elements of social inequality were balanced with the symbolic and physical employment of aspects of material culture (such as formalized food preparation and consumption) for conflict resolution and promotion of group cohesion. From the standpoint of these chapters, then, researchers have begun to explore some of the relationships between social organization, sedentism, and settlement practices in ways that address the complexities and subtleties of archaeological data and social systems, such as the spatial organizations of individual settlements and/or the existence of communal structures such as those identified at Cayonu, Hallan Cemi, Nevali Cori, and 'AinGhazal. Concentrating on the Epipaleolithic through Pre-Pottery Neolithic periods in the south-central Levant, in the fourth chapter Brian Byrd explores the degree to which, and timing of, changes in the size and organization of households in the transition to settled, food-producing villages. In brief, he notes that previous studies of Neolithic social organization have largely focused on social complexity and ritual behavior with minimal attention given to the understanding of the nature of household organization. Fur thermore, he argues that early agricultural villages in the Near East were characterized by a restriction in the social network for sharing production and consumption activities and by the development of more institutionalized mechanisms for integrating the community as a whole. Drawing on ethnographic sources, Byrd suggests that communities were composed of nuclear or extended households and discusses how such inferences can be linked to specific archaeological correlates. One aspect of this change appears to be the continued reinforcement of community social order by leaders while inequality was expanded within and between households. In discussing exceptions to this pattern, he noted that several other factors may have influenced the temporal and spatial patterning for Pre-Pottery Neolithic period households, including site setting, degree of settlement permanence, extent of reliance on domesticates, degree of household autonomy, and total settlement population.